In the second round, the Dodgers had two selections — similar to the first round. At No. 67, they selected Plano High School (Texas) outfielder Mitchell Hansen. At No. 74, the pick acquired from Baltimore in the Ryan Webb trade, they selected Virginia right-handed pitcher Josh Sborz. When you first see Hansen, the first thing you think is projectability. He’s 6’4, 197 pounds and has the ability add weight and reach his plus-power potential. He has a wide base as he sets up in the box — a little wider than shoulder-width. He holds his hands high up by his ear and is generally quiet pre-pitch. As he starts his swing, he bends his knees just a bit to not be so up-and-down in his stance. He also moves his hands toward the catcher as he lifts his front leg just slightly off the ground. It goes forward, but it’s not much of a stride. His bat is really quick to the strike zone and is surprisingly level for a left-handed hitter. He’s able to also clear his hips to help generate above-average bat speed and power potential. He has above-average speed, but I doubt that speed is put to use to steal bases. More likely, he’ll be better underway and can cover more ground than your average corner outfielder. I don’t think it’ll play in center field unless it’s in a pinch. And he fits better in a corner, defensively, anyway. As a Stanford University commit, he would normally be a tough signing. Luckily, that shouldn’t be the case for the Dodgers. The slot recommended amount for this selection is $921,100. If Hansen is an over-slot signing, I’d say it’s a good bet that they Dodgers will save money on the Sborz (read more below) and/or with their 3rd-through-10th-round picks. I still think first-rounders Walker Buehler and Kyle Funkhouser get slot or just a bit more, but not enough to even come close to putting the Dodgers in danger of going too far over their allotted amount. As an older prep player (already 19 years old), he should begin his career in Ogden with the Raptors. If not, he’ll go to the Arizona Rookie League before getting to Ogden later in the season. Stop me if you’ve heard this one before: Sborz was a closer in college and the Dodgers are going to try to make him a starter. Now look, he isn’t Chris Reed, but he might very well be Josh Lindblom, which wouldn’t be all bad. The Dodgers have also tried this with last year’s 6th-rounder Brock Stewart, who is enjoying some success in the lower minors. Sborz has a big fastball the sits in the mid-90s. That’s out of the bullpen. In the rotation, I’d expect that to drop a couple of ticks. He sat 93-95 and touched 98 MPH in the bullpen. I’d expect more of a 90-93, touch 96ish as a starter. And it remains to be seen if he can sustain the velocity for 5-6 innings. He gets a little sink on his fastball which he might be able to develop further if he experiences a velocity decrease. He backs up his fastball with a slider that flashes above-average potential. It’s a mid-80s offering that features some good depth and tilt. He also has a fringy-at-best curveball and changeup that will need to improve if he wants to remain in the rotation. He has a good frame at 6’3, 225 pounds. That will hold up in either the rotation or the bullpen. Everything about his delivery is somewhat normal as he turns on the rubber. He has a good leg kick and drives off his back leg as his top-half is pointing at a 45-degree angle toward the sky. His front foot strikes and he’s in good position with his arm. But his arm action is something to keep an eye on. He drops his arm below his knee before bringing it back up to deliver the pitch. There’s some unnecessary movement in his delivery that might need to be smoothed out in the pro ranks. It makes it difficult to repeat his delivery, leading to command issues (44 walks in 77 innings in his sophomore season as a starter) and looks much more like a reliever. The slot-recommended amount for this selection is $827,000. 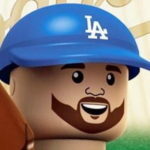 Seeing as Sborz is likely a reliever and was ranked 114 by MLB.com, 153 by Baseball America and 154 by FanGraphs, the Dodgers should be able to save a little bit of money on this selection. He should begin with the Ogden Raptors with an outside chance of reaching Great Lakes by season’s end.